zoomingjapan suggested rotenburo (露天風呂 / outdoor hot spring baths), and Rokko-san (六甲山 / Mt. Rokko in Kobe); Japan Australia suggested ronin (浪人 / a samurai without a master), ropeway (ロープウェイ / Japanese for cable car), and rotenburo; ThroughTheLookingGlassAndDownTheRabbitHole suggested Roppongi (六本木 / an area of Tokyo); and Paul suggested rokurokubi (轆轤首 / a yokai (monster) with a very long neck). Yokai (妖怪), monsters and ghosts from Japanese folklore, come in all sorts of shapes and sizes. Not all of them are evil, some are just mischievous. Being only a couple of days past Halloween, today seemed like a good day to take a closer look at one particular yokai – rokurokubi. Legend has it, rokurokubi look like normal humans (usually women) during the day, but at night they are able to stretch their necks so that they become really long and change their faces into terrifying demons to scare people. 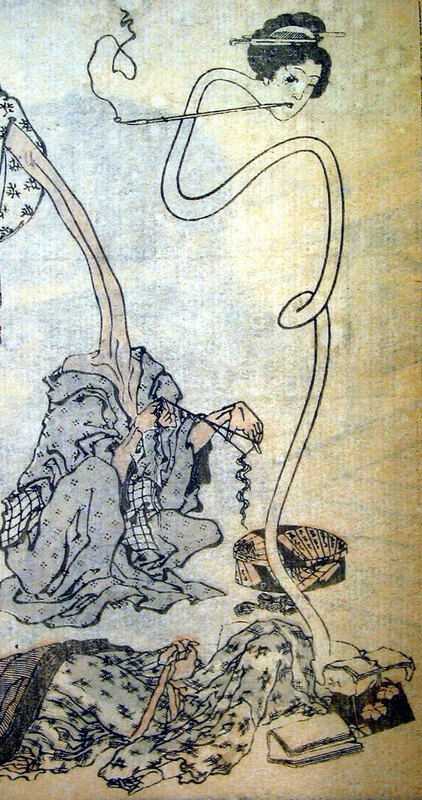 There are many different tales involving rokurokubi, and some say that they were once normal human beings who were transformed because of breaking some of the rules of Buddhism. 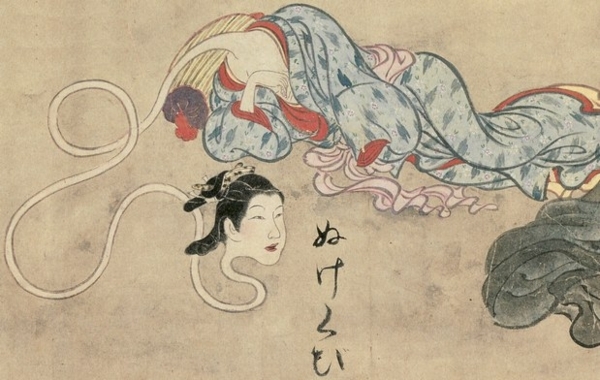 Sometimes these rokurokubi are even depicted as being blood-drinking, people-eating monsters. As with all yokai, you’ll find that they crop up regularly in art, anime and manga. 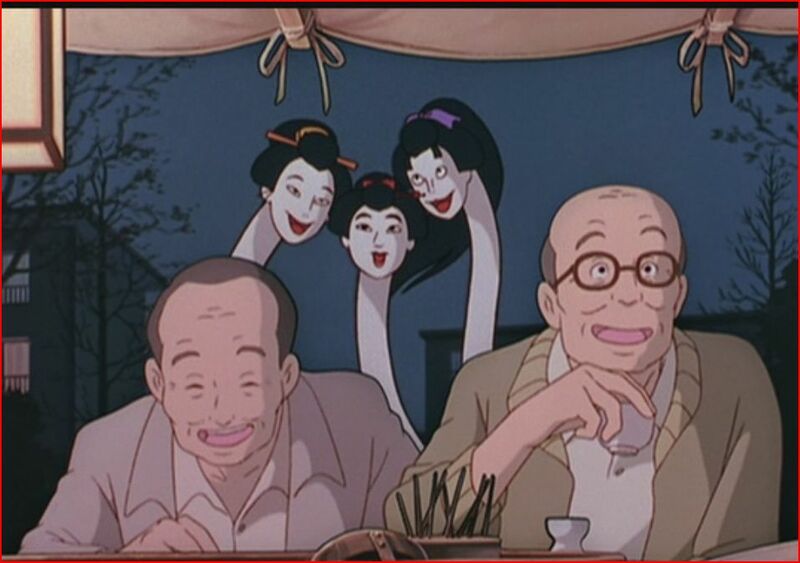 In face, if you’re a Studio Ghibli fan you might recall a scene in the film Pom Poko (平成狸合戦ぽんぽ) in which rokurokubi appear. In the scene, the tanuki are staging a parade of yokai in order to inspire belief and fear among humans. Two men are drinking in an outdoor bar, talking about how silly these childhood beliefs in ghosts are, and behind them the parade passes by. One of the types of yokai to appear behind the two men is a rokurokubi – well, three of them in fact! Japanese monsters and ghosts really do fascinate me, so you can expect more posts on this topic in the future! What’s your favourite yokai? Next week will be the LAST in the series, and we’ll start with わ (wa). Please leave a comment below suggesting a topic for things beginning with わ. Topics can be anything, as long as they are connected to Japan – food, places, people, characters, whatever you want to hear about! Just remember that the words you suggest must be Japanese words. Wakayama (prefecture), wasabi, washoku (Japanese cuisine), wakame (seaweed), wa (Japanese cultural concept translated as harmony). Yeah, I finally got from A to Wa! 😉 Thanks for all your contributions! Haven’t joined this several weeks… But glad I can write some before finish! Thanks for your ideas for next week! Congratulations at reaching わ – it’s been a great series of posts.